The Slave Lake Midget Thunder’s third game at the Midget ‘C’ Provincials this past weekend might have been their best. With not a lot to play for at that point except pride and the fans in the stands, they almost pulled off the impossible. How impossible? How about a tie game in the third period, while getting out-shot 70 – 18 and taking twice as many penalties as the other team? The Thunder should not have been anywhere near a tie game at that point, and somehow they kept turning back the Tofield Titans and scoring on almost one out of every three shots they got on net. The big crowd really appreciated it, roaring and applauding in a way a minor hockey team in Slave Lake seldom gets to hear. Steven Cardinal was a giant in the Slave Lake net. Seventy shots – probably about 40 of those on Tofield powerplays. Yet it was Slave Lake that got three of its five goals on the powerplay – plus one shorthanded. The Thunder improbably led 2 -1 after one period, completely against the run of the play. Dominique Wapahoo squirted loose for a couple of chances and buried both of them. Cardinal stopped 20 of the 21 shots he faced. He probably thought that was a busy period, but it got even busier. In the second he saw 28 pucks on net and allowed three goals. The Thunder scored once that period, courtesy of Cory Derkoch. It was Derkoch again banging one home to tie the game at four in the third, which almost brought the roof down in the Tervita Arena. But Tofield struck back quickly, making it 5 – 4 just 20 seconds later. Tofield scored the winner four minutes later. Gerik Giroux made it a one-goal game with 6:27 left, but that’s as close as it got. So… three games, three losses for the host team. Not what they hoped for, but some things to be pleased about. Their results improved through the three games. It started with a 5 – 1 loss to Fort Macleod on Thursday night, with Wynston Martens getting the only Slave Lake goal. Penalties were few and shots were close to being even. Friday against Whitecourt the Thunder lost 8 – 5 – not a bad result when being out-shot 53 – 18. Derkoch and Dylan Neilson both scored twice, with Tyler Emes getting the fifth. As far as the other participants went, LaCrete and Duchess advanced to Sunday’s semis along with Whitecourt and Tofield. 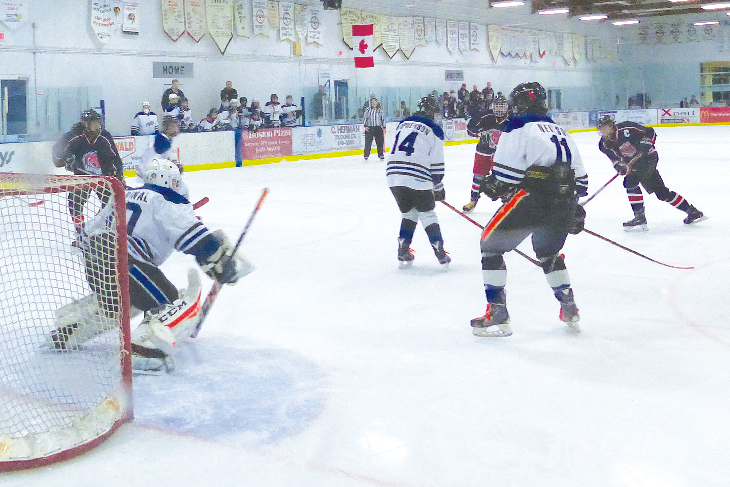 Tofield beat Duchess 5 – 2 and the LaCrete Lumberjacks got by Whitecourt 2 – 1 in the second period of overtime. In the final, LaCrete overpowered Tofield, winning 3 – 1. All three Lumberjack goals were scored on a five-minute powerplay in the second period. After that, the boys from LaCrete played a splendid defensive game, shutting down every effort Tofield made.